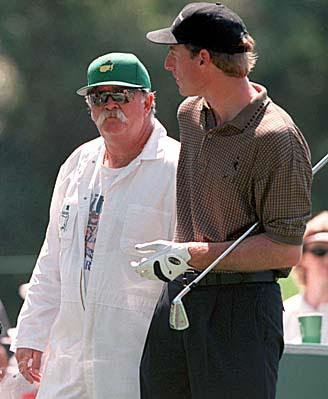 When Ian Woosnam was penalised 2 strokes for carrying 15 clubs, as he led the 2001 Open Championship at Royal Lytham & St. Anne’s, I thought that it would never happen again in tournament play, especially after he fired his caddie two weeks later. Well, on Saturday, at Liberty National, across the Hudson River from Manhattan, Jim Furyk’s experienced caddie, Mike ‘Fluff’ Cowan, who most of us will remember from when he was Tiger’s caddie, also forgot to count his player’s clubs on the first tee. Jim Furyk was penalised 4 strokes, which cost him a lot of prize money as he ended up in 15th place, just 6 strokes behind the winner. So, why was Ian Woosnam penalised only 2 strokes and Jim Furyk penalised 4 strokes? It is Rule 4-4 that stipulates that a player must not start a round with more than 14 clubs. In stroke play the penalty, regardless of the number of excess clubs carried, is two strokes for each hole at which any breach occurred, with a maximum penalty per round of four strokes. In match play, at the conclusion of the hole at which the breach is discovered, the state of the match is adjusted by deducting one hole for each hole at which a breach occurred with a maximum deduction per round of two holes. As the Woosnam breach was discovered on the 2nd teeing ground, before a stroke had been made, he incurred a penalty of only two strokes for the breach of the Rule on the 1st hole. At the Barclay's Jim Furyk had already played his tee shot to the par-3 2nd hole when he realised that he had an extra wedge in his bag, which meant that he was carrying 15 clubs. If he had not discovered that he had more clubs in his bag than is permitted until after commencing play of the 3rd hole it would not have affected the penalty, which is capped at four strokes per round in stroke play. However, when a player realises that he is carrying more than 14 clubs he has to immediately declare which club(s) he is taking out of play and if he uses that club or clubs during the remainder of the stipulated round he will be disqualified. The moral is to always count your clubs on the 1st teeing ground! Author of ‘999 Questions on the Rules of Golf’, a book that will help you understand the Rules the easy way. Important to note that Woosie didn't fire his caddy over the extra driver in the bag - it was as much his own fault as it was the caddy's. He did fire the caddy two weeks later for being late. I accept that it was only after Myles Byrne arrived late for a tee-off two weeks after the 15 clubs incident that he was actually sacked, but I think that Woosie's comments on the 2nd tee shows where he thought that the responsibility lay; "I give you a job to do and you can't do it". In my opinion the oversleeping episode gave him just the excuse that he needed to avoid bad press for sacking his caddie of just 10 weeks for a single mistake. Those were his comments on the 2nd tee, but he did calm down later and take the blame himself. You may be right about the last straw coming two weeks later, but there was nothing to stop him from firing Byrne after the round - bad press or no. He was right to accept the responsibility himself, the press would have been on him either way...and how do you not notice a second driver cover ? It's the largest headcover.